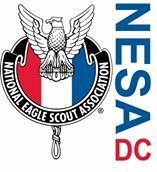 March 19, 2019 – 6:00 – 8:30 p.m.
at the Army Navy Country Club, Arlington, VA.
Join fellow Eagle Scouts and civic leaders in honoring some of the area’s most accomplished men of distinction as we present the NESA Outstanding Eagle Scout Award (NOESA), Scouting’s national recognition of extraordinary professional achievement at the city, state, or regional level. Business attire requested. We will also present this year’s youth recipient of the Glenn and Melinda Adams Eagle Scout Service Project of the Year Award! National Capital Area Council, BSA. To learn more visit us at www.NCACBSA.org/NESA.